Pinar Aksu works with Maryhill Integration Network as a Community Development worker in Glasgow, and with Active Inquiry using Theatre of the Oppressed methods. She has been involved with asylum and refugee rights since a young age. She is involved and a committee member at the Night Shelter for Destitute Asylum Seekers, Glasgow Campaign to Welcome Refugees and Stand Up to Racism Scotland. Whilst living in London Laura completed a Masters in Human Rights at the London School of Economics and worked with refugees and asylum seekers in the charity sector. Laura then decided to move into the legal sector and qualified as a Solicitor. She currently works for a legal aid firm based in Manchester working in Public and Housing Law where she assists unaccompanied asylum seeking children in age dispute cases and in securing accommodation and support from the local authority, families with no recourse to public funds in accessing housing and support and refugees and asylum seekers in accessing suitable accommodation and support from the Home Office or local authority as appropriate. She is also an active member of voluntary organisations in the area short-term holding facility based at Manchester Airport. Catherine has worked at the University of Cambridge’s interdisciplinary research centre, CRASSH, for the last 15 years. She has recently become active with organisations concerned with immigration and asylum in a voluntary capacity. She emigrated to Canada from the UK with her family as a baby but has only recently begun to think of herself as an immigrant. Tienga was involved in setting up the Cameroon Community Welfare and Development Association (CACOWEDA), and was a trustee of the Notre Dame Refugee Centre from 2003 to 2010. He coordinated the activity of the Cameroon Support Network until 2011, and was very involved with the Strangers Into Citizens Campaigns both in 2007 and 2009. He has also been a Trade Union Rep, and worked as an advisor in welfare rights and health and social care. Hinna is currently seeking asylum in the UK. Having completed her MSc Development Economics from University of Sussex, Brighton Hinna is now living in Manchester. Hinna is a blogger, who has also written articles and spoken at various platforms to raise awareness of Religious Persecution, including Aid to the Church in Need, a Pontifical Foundation of the Catholic Church supporting Christians where they are persecuted. She is actively involved in promoting religious freedom and social cohesion in Manchester through her work with Religious Freedom & Business Foundation as Research Fellow and coordinator for interfaith Empowerment+ Initiative. Moved by the hardships of UK’s asylum process herself, she is now also keen to help others who are seeking asylum in the UK. Hinna co-coordinates Boaz Night shelter for destitute asylum seekers and refugees, volunteers at RAPAR as a caseworker, and is passionate to do her bit in promoting human rights through involvement at Right to Remain. Katherine is a retired solicitor and mediator and has recently moved to live in St Ives, Cornwall. She is a Local Preacher with the Methodist church and a member of the Iona Community. Whilst living in Glasgow she was active in work with asylum seekers and refugees, and was a Trustee and Secretary to the Board of Trustees of a Nightshelter for Destitute Asylum seekers. Robert works as Head of Finance for the Scottish Catholic International Aid Fund and formerly worked for The Iona Community, Richmond Fellowship, NACRO and Oxfam. He serves on the Board of Positive Action in Housing and has been a voluntary committee member for many other community bodies and charities. He is a professional qualified accountant. Phill has over ten years experience as an asylum caseworker with Refugee and Migrant Justice, the Immigration Advisory Service and more recently as a caseworker and researcher for the Manuel Bravo Project. Phill is also a final year PhD student in the Department of Anthropology at Goldsmiths, London. Hyab is an Eritrean refugee in the UK, completed an MA in Migration and Diaspora Studies at SOAS University of London, worked as an Education and Employment Adviser for a charity based in Leeds and is now studying for a PhD at the University of Glasgow. 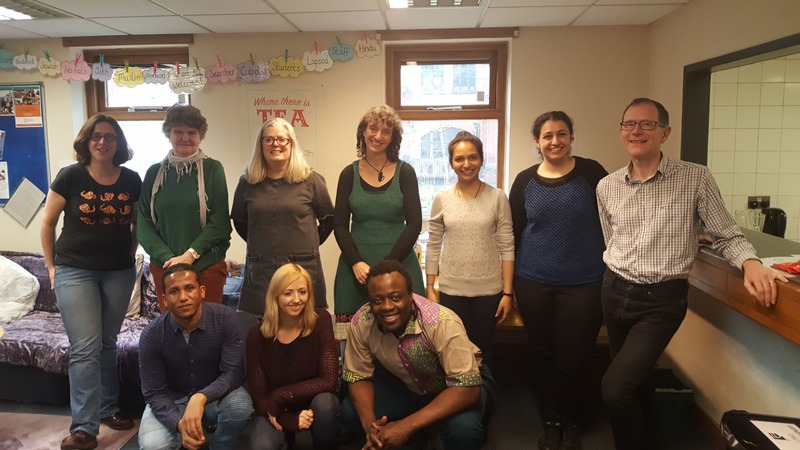 Hyab in his career engaged extensively with refugees and asylum seekers at different positions ranging from community facilitation to casework and community organising in Sudan, in Egypt, and in the UK. Having a first-hand experience of human trafficking, Hyab has a research interest in refugee trafficking (which he wrote his MA dissertation on) and the ambivalent position of ‘the refugee’ as ‘unprotected’ figure.